A big issue which women with tightly coily hair have, is the challenge of finding products which will lay our hair down smooth with shine and hold. 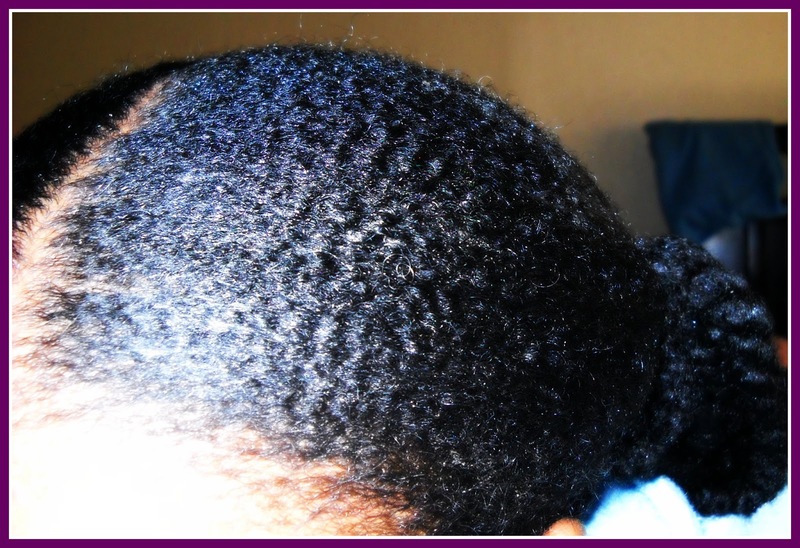 Gel is not always the answer for the 4C woman because gel contains larger amounts of water. Gel has a tendency to draw coily hair up tighter than it naturally is, this makes it difficult to achieve or maintain a sleek back bun or ponytail. As with every woman there are times that coily hair women want to wear a simple ponytail or a professional bun. However finding the right product to achieve this look makes it difficult. One product I recommend for tightly coily or 4C hair ladies is a curl control paste by Curls. This product will smooth down your tightly coily hair. At first glance and feel it will remind you of the product Jam, but this product beats Jam by a thousand percent. Mixes well with other leave in conditioners. My hair after shampooing with no product on it, as you can see. my edges coil up and separate greatly. It has been a task to find a product that would smooth down my edges. Curls control paste was applied and my hair smoothed back with my hands. No brush was used. You just keep smoothing and smoothing until you hair lays flat. It takes longer because you are not using a brush. But in the long run it is healthier to smooth with your palms on tightly coily hair, this will keep your breakage to a minimum. A soft bristle tooth brush was used very lightly to smooth down edges. Notice my hair gives the appearance of the 3C curl pattern using this product. Benefits last for 3-5 days, I only reapply a natural oil daily. This paste gives your hair shine and hold. My pictures do not convey the true shine this product gives your hair. This is how much product I used after two uses, it does not take a lot. My hold lasted for 3 days. At night I wrapped it in a scarf and in the morning I applied: coconut oil, olive oil, avocado oil or grapeseed oil. On day two I applied a little more paste to my edges only. When you take your bun down your hair is still soft and moisturized. This product is a Royal yes! So tell me have you tried this product on your tightly coily hair? If not, have you found a product which is good for smoothing down tightly coily hair? Hi. Roughly how much product did you use to achieve this? Not a lot and the hold lasted all day. Truthfully I didn't re-apply for 2 days. At night I tied it down of course, then in the morning I apply a natural oil and started my day. By day 3 I applied some more curl control paste to the edges only. If you decide to try it do not just start packing it on, do it little by little using the index finger. I wrote another article on this product in which I also did a twist out. I will link it here. Ooh thanks ive been using eco styler just on my edges cause i despise gel. Great Post! Do you apply this to either wet, dry or damp hair? Which gives you the best results? I applied it to dry hair. It works try it again, No need to wear a tight band I never wear them. Try it again, I have to see this product not work. Be sure your hair is clean and has only leave in conditioner in ti. Wait until your hair dries and smooth it back. I do cover with a scarf until it sets and I do use a scarf at night, but I do not wear any type of other bands. So try it again. OMG. i've tried and failed so many times with eco styler and other gels, to smooth down my edges. After coming across your blog; i took a step of faith and ordered this product. And my edges; my 4c hair has never ever looked smoother and sleeker. Thankyou soo much. Keep up the good work!!! I FEEL YOUR PAIN! I was the same way I had just resolved that it would not happen for my hair, lol. Once at a hair show I came by the Hicks booth and the lady put some in my hair and it laid down nice, so I brought some and was excited. However it did not stay laying down by the time I made it back home, well you know what happened. The I found out about curls control paste and I am in love! I am so happy to pass this information on to you and thanks for sharing your success with me and for reading my blog. Blessings!!!!!!! How did you let your hair dry? In twists, braids, ponytail etc? Hello! For the bun I just tied it down and it dried overnight. I rarely twist with it but when I do I let it dry for 24 hours then take my twice down. So they dry pretty much the same way I always let my hair dry. So just to clarify, it is applied to 'freshly washed damp hair after LI is applied', then smooth hair back with hands into a ponytail; tie down and leave to dry overnight . Assuming you could set under a dryer if style was needed same day/evening. So you tried the control paste and you hair still got frizzy quick? Ummm, well I do know it only works for me on freshly washed hair. I used the shea moisture smoothie under it and another time I used cantu leave in conditioner . Maybe try it again on freshly washed hair. My hair has a very tight coil and it is the only thing that has every laid it down and stayed smooth all day.....You can purchase your products from CVS, Walmart or Target, keep your receipt so if they do not perform well you can take them back. This way you are not stuck with a product you can't use....Blessings!!! where can i buy this product?And how much is it? How did you get all of your hair that wavy after your wash? Can you tell us the process of getting washing your hair and everything? I've been transitioning for about a year now and I have 4c hair. Maybe something more course. My hair is always dry and I just don't know how to care for it. I love the wavy look of your hair in the pictures, but when i wash my hair it just looks like a horrible nappy mess and it really just makes me to go back to perms. I can't take it. My hair was freshly washed. The product featured above helped to lay it down. So I simply smoothed it back while still wet. Applied on the curls control paste product to help my hair lay down. Then immediately tied it down with my scarf over night. It came out like this. I smoothed on some oil for extra shine. Because Afro hair is coily when you smooth it down it will wave up naturally due to the shape. You have to use product and water in order to keep it smoothed down. How do you get your hair to take on that nice and wavy appearance in the pictures? I've been transitioning or a little over a year now and whenever I wash my hair it just comes out as this nappy matted mess that I can't stand to look at. I've experimented with tons of hair product and it just seems that no matter what, my hair is rough and looks and feels like brillo pad. Don't even get me started on my puffy edges. I have this same edge shuffle that I apply, but it never looks like this. Could it be that I have to apply it to damp edges? (I typically apply it when my hair is dry, and just add oil). Please help. It feels like wherever I look, the girls are 3c, 4a, or 4b with nice kind of defined curls...and then there's me. There have been so many times when i considered perming again, but I'm really trying to give being natural a chance.